Dharma sustains everything in God’s creation. It is the foundational force, the hidden mechanism or the operating system which ensures the order and regularity of the worlds and beings. The same Dharma operates in your too as your supporting system and guides your actions. Whether you are breathing, eating or sleeping, you are manifesting the principles and functions of Dharma only. Everything in the universe has its own Dharma. Your body has its own dharma. Every organ in it has its own dharma. So is everything else, whether it is animate or inanimate. According to our scriptures If you follow your Dharma (svadharma), you are safe. You will be protected and supported. If you violate it or abandon it, you will open yourself to innumerable vulnerabilities and threats, and your life will turn into chaos. Therefore, in the battle of life, wear the armor of Dharma and fight the battle. This is also the essence of the Bhagavadgita and many other scriptures. Their main theme is let Dharma be your guide, teacher, protector and preserver. Go where it leads you, with faith in your heart. Practising Dharma, walk on the path of Dharma to reach the world of Brahman. It is the hub of the wheel of Brahman, the source of all Dharma. Dharma may be an ancient word, but it is very much relevant even today. Perhaps, in Kaliyuga it is even more necessary. 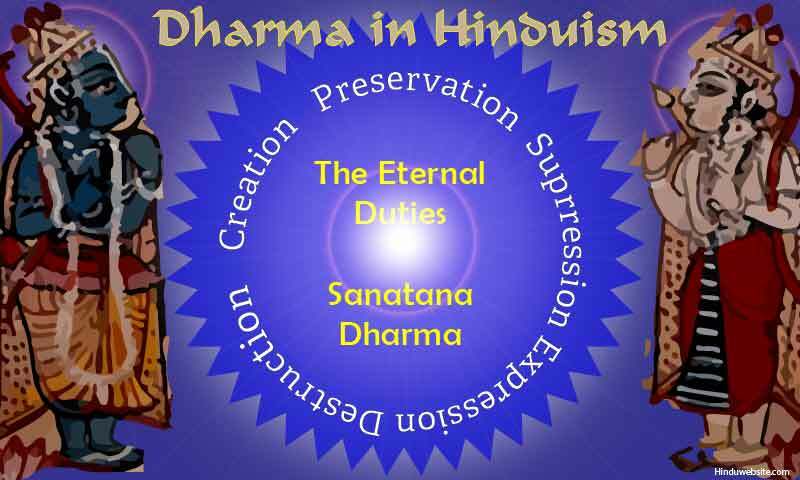 In this modern world, what are the standing principles of Hindu Dharma, which you can use in your daily life? In this essay, we will present a few important principles of Hindu Dharma to which you can relate and which you can practice to regulate your life and actions, without compromising your moral and spiritual values. Although some schools of Hinduism do not recognize God as the creator, in main stream Hinduism God is everything. He is both the creator and the created, the all-pervading, indestructible, eternal reality, who is both with form and without form. He is also the embodied Self in all. He rules Creation as Isvara, the lord of all, and the mortal world as Death (Kala), the devourer. Ideally, the whole creation is sacred and every object in it, including you, is worthy of veneration. One should, therefore, live upon earth as an aspect of God and perform his duties for the welfare of the world. You are not only an aspect of God but also an eternal soul, which is indestructible, infinite, without qualities, name and form. The soul is neither the body nor the senses nor the mind, but other than them. In truth, he is their lord and the witness (sakshi) to all their functions, modalities and modifications, just as God is to creation. The body is alive as long as the soul is present in it. At the time of death, it leaves the body along with the deities who are present in it (breath and senses), and goes to the ancestral world or to the world of Brahman according to its destiny. Hindu Dharma expects that you should identify yourself with your soul rather than with your name and form which are temporary. When you do so, you overcome the fear of death and transcend your physical and mental identities. In Hinduism, obligatory duties have a great significance. As an aspect of God and as an eternal soul who participates in the drama of life upon earth, you have an onerous responsibility to participate in it and do your part. If you decide to be part of the world and live as a householder, you have to meet your obligations as a human being and perform your actions to ensure that you manifest the will of God rather than obstruct it. As an aspect of God, you must work in harmony with God and fulfill the aims of creation. It means you must do whatever is expected of you as divine entity in the multiple roles you perform upon earth such as a child to your parents, student, sibling, adult, householder, spouse, parent, grandparent, master, owner, servant, devotee, renunciant, member of society and so on. The idea of sacrifice is central to Hinduism. In a general sense, sacrifice means giving, offering, helping, contributing, facilitating, nourishing and supporting God’s creation as his aspect and personification upon earth. It also means making offerings of food, etc., to gods and others as part of your daily obligatory duty. In doing so, you must be free from desires and attachments and perform your actions without expectations as a service to God. This is the essence of karma yoga. If you perform actions without selfish intentions, you will be free from karma. Otherwise, you will suffer from their consequences and remain bound to the world. Thus, Hinduism broadens your thinking and approach to life and helps you control your selfishness and evil qualities with selfless duty, devotion, detachment and sacrifice. It reminds you of your divine nature and your connection with God. By practising it you can find him within yourself through transformation and purification. Hinduism is a religion of the soul. However, it does neither ignore nor undermine the importance of physical life in achieving liberation. With its help, you can regain your lost spiritual awareness and identity and find freedom from the cycle of births and deaths.